Instrumentation should be affordable, reliable and easy to use to enable as many people as possible to contribute to research. The instruments developed to work with PhotosynQ try to bridge this chasm between what is currently available and the for mentioned goals. The MultispeQ v2.0 is the next iteration of the MultispeQ v1. Improvements have been made to the case, electronics and an LED has been replaced. Like the previous version, it measures fluorescence base parameters like qL, qP, ΦII, LEF, NPQ, and absorbance based parameters like vH+, gH+ ECSt and relative chlorophyll content. It can collect environmental parameters like temperature, relative humidity, barometric pressure, leaf temperature, light intensity, cardinal direction and tilt. Internally one of the sensors has been moved to improve measurements using a connected air pump. Further the 850 nm LED has been replaced with a 810 nm LED. Now the instrument has an charging indicator and an RGB progress/action indicator LED. The MultispeQ v1.0 is based on the experiences we gained from our development of the beta version. It measures fluorescence base parameters like qL, qP, ΦII, LEF, NPQ, and absorbance based parameters like vH+, gH+ ECSt and relative chlorophyll content. It can collect environmental parameters like temperature, relative humidity, barometric pressure, leaf temperature, light intensity, cardinal direction and tilt. The signal quality has been increased to allow absorbance based measurements like the electrochromic shif in the field within a reasonable time. 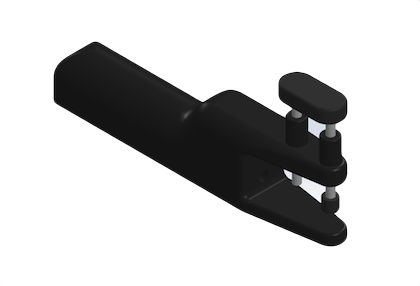 The ergonomy and the leaf clamping has been improved based on experiences in the field. This instrument was the first developed as a proof of concept to show it is possible to measure photosynthetic parameters with an easy to use, field deployable instrument. This includes parameters like fluorescence base parameters like qL, qP, ΦII, LEF, NPQ, and absorbance based parameters like vH+, gH+ ECSt and relative chlorophyll content. On top, it can collect environmental parameters like temperature, relative humidity, light intensity and CO2 concentration. It has been a reliable workhorse for the last two years and is still used in several studies. For more details and our validation of the instrument, please read the publication (open access). Please contact us if you are interested and want to know more about the prototypes and future projects or start a collaboration. 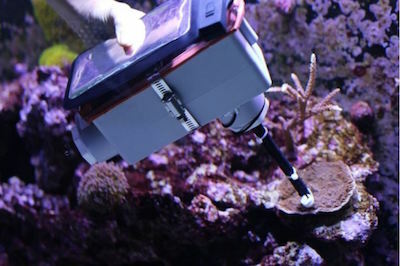 The CoralspeQ a portable hand held device used to monitor bleaching events in coral communities. 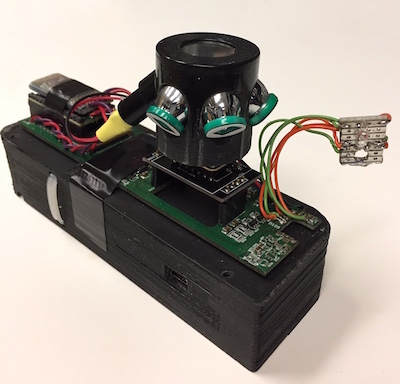 The device is built on the beta MultispeQ circuitry and uses a Hamamatsu miniature spectrometer to take spectrally resolved fluorescence and color reflectance measurements. 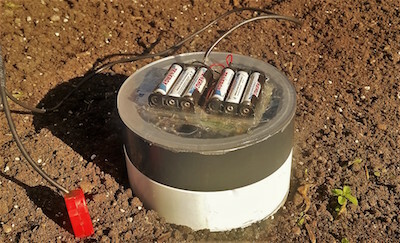 This instrument uses an accurate, low cost sensor to quickly measures changes in CO2 over time, allowing users to estimate CO2 evolution from soils. The instrument also includes a temperature/rH sensor, bluetooth, and a soil moisture probe. 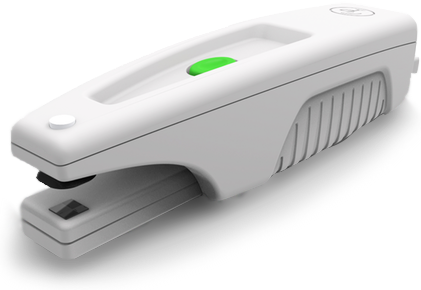 The GrainspeQ is a portable handheld device that can measure PAM fluorescence, spectrally resolved fluorescence, and color reflectance. It is currently being developed to detect the presence of aflatoxin on whole grains and milling products. Determining the accurate leaf thickness could be usefull to identify traits with significant differences, or getting an estimate of the biomass. 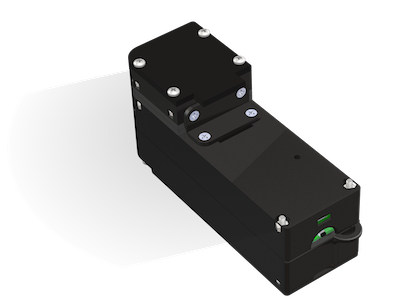 This prototype allows to determine the leaf thickness with an accuracy of up to 10 microns. Currently it only works through micro-USB and which powers the instrument and transfers the data.